Esce come singolo in vinile a tiratura limitata - 500 copie - la rilettura di uno dei brani più celebri dell'album Camembert Electrique, scritto pensando a Kevin Ayers e divenuto un vero classico Gong: Tried So Hard, qui nelle versioni di studio e dal vivo dell' Invisible Opera Company of Tibet registrate quest'anno con l'attiva partecipazione di Daevid Allen. Disponibile presso Planet Gong. 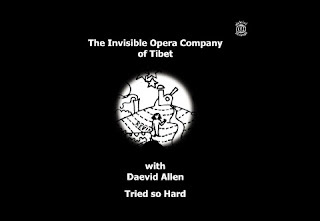 The Invisible Opera Company of Tibet have always included Gong tunes in their live set and played with Daevid Aallen often enough to be completely comfortable together, so they were ideally placed to record a version of one of the best 'classic' songs on Camembert Electrique. They have come up with a very finely tuned beast, one that ticks all the boxes. It has the powerful rocky edge of the Camembert original, but is perhaps even more meaty, as well acknowledging, and more than ably bringing out the lighter, aspirational, psychedelic and almost whimsical areas the song explores. 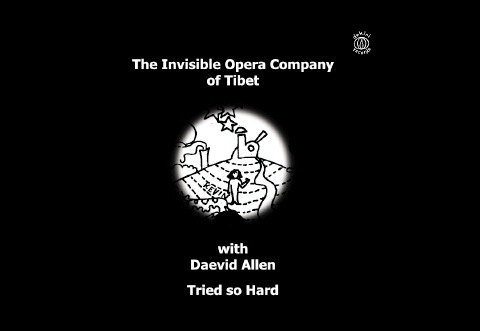 The production is clean, crisp and dynamically solid in a very pleaseing way and daevid is in great vocal form. As with any good new version of a well loved track it encourages and enables you discover overlooked dimensions and forgotten corners of what is a wonderful song. The whole release was inspired by and is a homage to the late Kevin Ayers, little know fact alert, whom the song was written about. The B side is a charged live version recorded by the same line-up at the Up Close with Daevid Allen event in May 2013.